Hue is an important city and also one of the economic, cultural, and culinary centers in Vietnam. 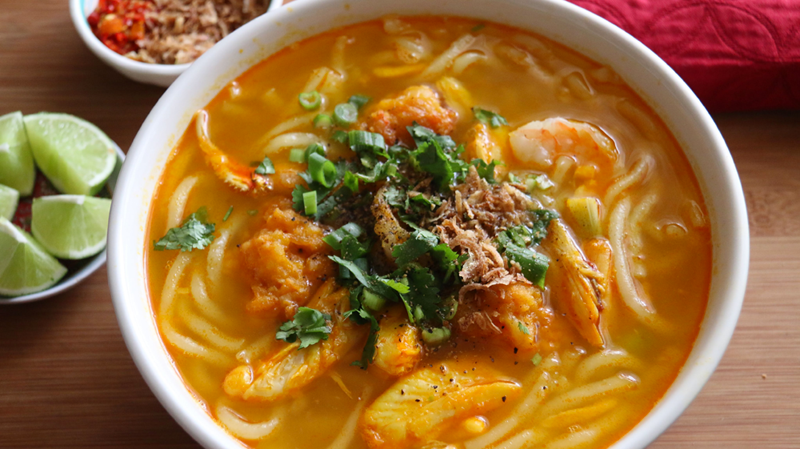 Hue food is really plentiful with several specialities which are famous throughout the country. Com Hen is a rustic dish which is sold everywhere whether in the village or country road in Hue. Com Hen contains rice, boiled mussel, star fruit, fish sauce, cabbage, onion, pepper, peanut, chili and variety of herbs. The specialty is all of these elements are cold. Com Hen has an extremely spicy flavor as such, so gastronomes remember it just after one time enjoying. 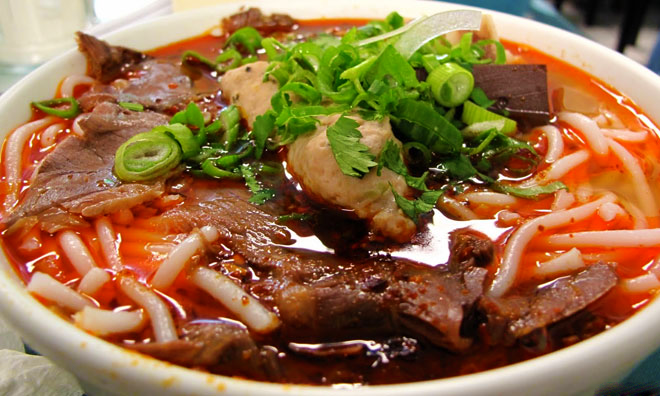 Bun Bo Hue – one of the most typical foods of Hue. Fine combination of ingredients make the food famous. The fame and delicious taste of this dish makes no discussion as it is on the list of the top 50 most delicious dishes in the world. Bun Bo Hue contains a piece of pig’s leg, a piece of beef pie and of course a few thin slices of beef. The fresh herbals to serve with Bun Bo Hue are also very fresh and plentiful. 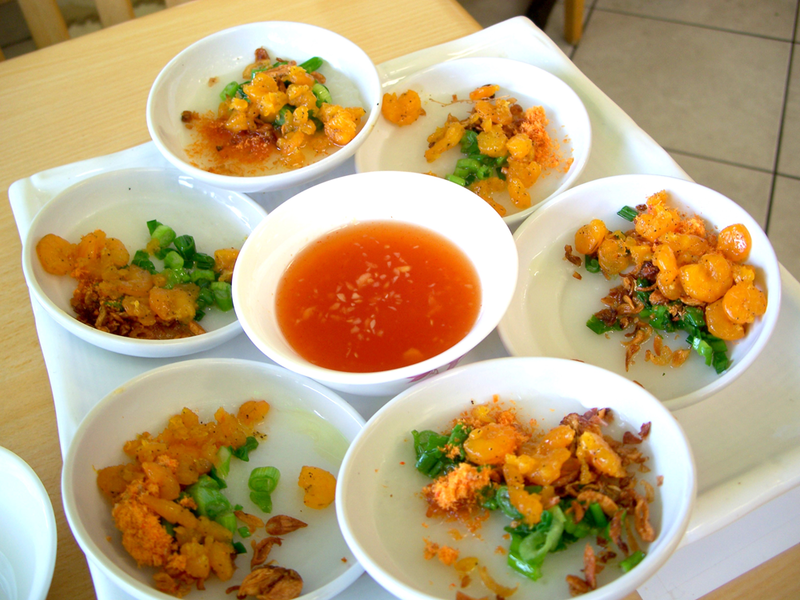 Banh Beo is a kind of small steamed rice pancake. 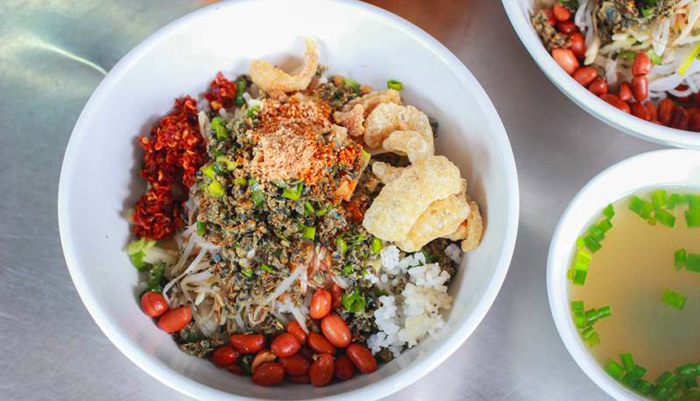 It is white in color, sometimes nearly transparent and usually has a dimple in the center, which is covered with savory recipes including chopped dried or fresh shrimp, scallions, mung bean paste, crispy fried shallots, fish sauce, rice vinegar, and oil. Banh khoai is so much like Banh xeo (sizzling pancake) since they both are made from rice flour, water, turmeric powder, added slivers of fatty pork, shrimp, bean sprouts and then pan fried. Banh khoai and Banh xeo also are wrapped in mustard leaf, lettuce leaves or rice paper, and stuffed with variety of herb, like mint leaves, basil and served with a sweet and sour mixed sauce. 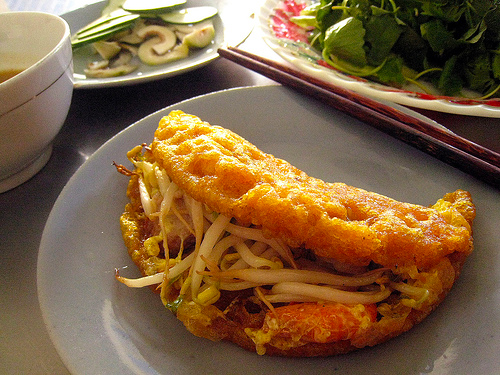 In Hue, Banh khoai is placed open-face instead of being folded in half like Banh xeo. Moreover, Banh khoai always goes with a fermented soy bean sauce, and people consider it a winter food owing to its greasiness and spicy taste of the sauce. Therefore, most Hue citizens only make them when winter coming. The central of Vietnam is reputable for its Mam tom chua (sour shrimp sauce) and Hue is the best place for this unique sauce. 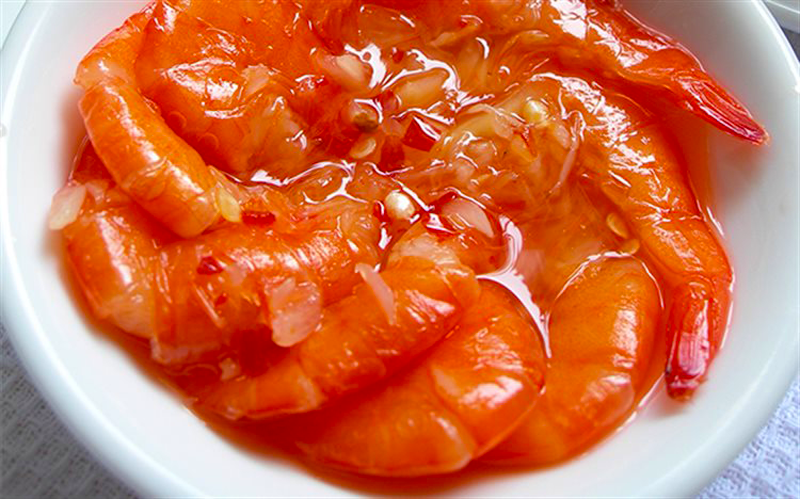 Unlike normal shrimp sauce (has brown color and smooth surface), Sour shrimp sauce has orange color while shrimps still keep its original shape. It is quite simple to make this sauce. First, shrimps are clean by salt water (do not use normal water to avoid bad smells) and “cook” by strong rice wine. The shrimps will turn red. After that, carefully mix the shrimps with sticky rice, sliced lesser galangal, garlic and chili. Slowly put all the mixture into a jar covered by guava leaves. Just need to wait for 5-7 days and we have the mouthwatering sour shrimp sauce of our own making. This is the best sauce for boiled pork with vermicelli.